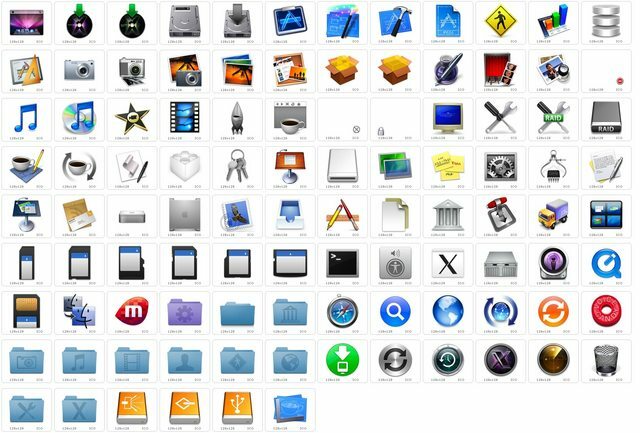 Total 255 icons directly from Mac OS X Leopard in PNG format (512*512 px - 96 dpi) for using with dock programs like ObjectDock, RocketDock or RKLauncer. IconPackager users download this icon theme. All Leopard icons are property of Apple Computer, Inc.
Update: Here is another Mac icon set for Windows with some extra icons: Mac OS X Leopard Huge Icon Pack. Leopard icons look amazing, far better than Vista icons! yoni5002 check the first post again. kampongboy92 released 512x512px icons. Mac has the best icons. Thanks for the png pack. For some reason when I click on any of the links, the DeviantART Doll says, FORBIDDEN. ??? Would you please help how i can create iconpackger file? Whats that squirting cube thing? The problem with these icons is that they're not perfect copies (the real Time Machine drive icon was jade green, not lime green, and others too). Edited by pauldacheez, 14 November 2008 - 10:59 PM. Ahh. Really nice! Thank you. I will be using this for a new Mac OS X feel for my windows! Thank you very much.